With deadpan delivery and expert timing, Chris Britten gives audiences “Chuckle Muscles” plenty of excercise a fine Comedian for hire for your event. His material is clean but cheeky, never blue, and he never resorts to bad language. Chris is at his most adept with mixed audiences, he is also a fine singer and Compere. Chris normally opens with a spot of Stand up Comedy which normally lasts 45 mins. After a break he sings, with bits of comedy in between. Chris sings a range of styles and songs which span the decades plus a superb dance spot if required. He can also do his famous audience participation ‘request spot’ in which the audience chooses the songs that he sings. Remember, you are booking an award wining popular Comedian for hire plus an International Singer in one affordable package. Chris Britten started singing at 14 and has sung with bands and later he became a Solo Singer. Chris then introduced Comedy into the act and has been one of the best ‘value for money’ Comedy Vocalists in the business. He has vast experience working in a wide range of venues such as Theatres, Hotels, Cruise Ships, Holiday Venues, Sports and Social Clubs, Golf and Other Sporting Clubs and Private Corporate Venues. He has also performed over many years at Masonic, Rotary and Round Table functions. 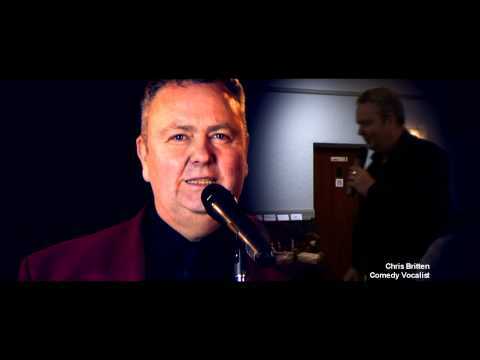 Chris Britten has a voice which is suitable for singing a wide variety of songs which span the decades. He loves to sing Swing, 60s, 70s, 80s, Ballads and songs for Dancing if required. I booked Chris Britten after seeing a 2 minute clip of his routine on the Costello Entertainments web site. From that clip, I thought this guy is funny, with a good singing voice (I have booked many artists over the years as a Social Secretary). On the night of our Gala Dinner he was fantastically funny and in the second half of the evening Chris entertained us with a repertoire of music to which he had his audience dancing the night away. At the end of the night Chris was given a huge round of applause. Chris is a very professional act and has a very friendly nature, if you are looking for an artist to entertain you book Chris Britten, you will be glad you did.